The average person will spend around 100,000 hours working. So is it any wonder that when we have some time off we want to throw away our business suits, grab colourful costumes, let our hair down, and dance until dawn? The following wild parties set the standard for the rest of the world. Image via Flickr by Gio-S.p.o.t.s. The annual Carnival of Ivrea celebrates the city of Ivrea’s liberation from a cruel medieval baron in an irreverent way. Forty days before Lent, party goers prepare for battle in Italy’s north. Nine teams arm themselves with their quirky weapon of choice: oranges! 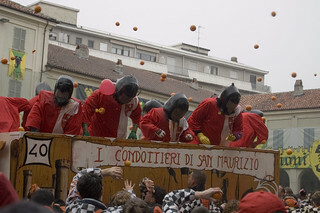 Around 580,000 pounds of fruit are thrown around Ivrea’s streets each year. Traditionalists typically get into the spirit with medieval costumes, but with all those oranges flying you might prefer a raincoat instead! The night before or after a full moon you’ll see around 30,000 revellers descending on Thailand’s party capital, Haad Rin Beach. This coastal hotspot in Koh Pha Ngan hosts one of the world’s most infamous monthly parties. Liquor is sold in buckets and illegal drugs are common, although the country’s tough penalties should be enough to deter anyone from touching the banned substances. There’s more than enough legal fun as you party to the techno beats and R&B grooves local DJs blast until the wee small hours. 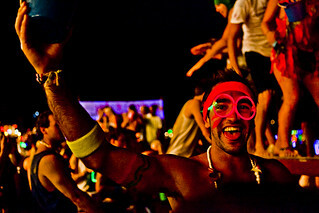 DayGlo outfits are the full moon parties’ unofficial costumes. Skimpy shorts and revealing bikini tops provide the perfect canvas for the body painters that frequent the celebrations. Just remember to team them up with sensible shoes to protect your feet from the broken glass littering the beach during the celebrations. Fasnacht is recognized in many parts of the world, but the biggest celebration is held in the Swiss city of Basel. The party starts at just four in the morning on the Monday after Ash Wednesday. Costumed musicians walk the city’s streets, alerting residents that the celebrations have begun! For three days, around 20,000 locals and tourists celebrate in Basel with parades of masked citizens. Dressed as soldiers, harlequins, and the farmers known as Waggis, they walk alongside the marching brass bands. While the heavy drinking that goes along with Fasnacht is strictly for the adults, children also have a big part to play. On Shrove Tuesday they join a procession with their parents known as the Children and Family Fasnacht. Along with traditional Fasnacht outfits, popular kids costumes include princess dress for girls and cowboy clothes for boys. The arid wilderness of Nevada’s Black Rock Desert comes alive the week before Labor Day for the annual Burning Man Festival. Since the summer solstice was first marked there in 1986, crowds wearing colorful and quirky costumes have gathered to celebrate art, culture, and self-expression. You can expect to see superheroes, dandies, clowns, and warriors all coming together for this wild event. Customized trucks known as “mutant vehicles” and the burning of the 40-foot figure that gives the festival its name are all part of the week-long party. So next time you’re struggling through the drudge of another nine to five, don’t sweat it. The next big party is just a plane trip away!